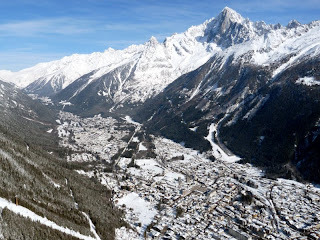 Last week our family spend the traditional Finnish "skiing" vacation in style: we were in Chamonix, France. Joanna and the children challenged themselves on the various slopes every day, enjoying the sun, the huge mountains and the stunning views. Whereas I myself managed to fly all but one day, typically in very light conditions. The weather was characterized by northerly winds, causing the main Planpraz site to be in the lee. This was not a problem, but it may have caused the thermals to be "broken"; in any case they were very small in all dimensions. Nevertheless the flying was nice and interesting. I'd never started from really snow covered slopes; here there was actually a ski piste prepared just for us pilots! On Friday there were no clouds at all and it turned out the best day of the week with somewhat stronger and slightly larger thermals. I made two flights, in the first one I had a nice thermal bubble right after launch and I could turn up to above take-off and the lift station, but then it was again over. Inspired I went back up for a second flight. Now only got bits and pieces of boyant air straight after launch, but once I was some 600 m below take off found a good thermal close to the mountain. I had to do figures of 8 in it, but it did carry me a good 150 meter back up. A bit later found a similar but shorter-lived one (or then I simply found it near the end of its lifetime) and then it was time to land; after 30 minutes, the longest flight of the week. Working such patches of light lift makes for excellent practice and in those settings it is great fun!